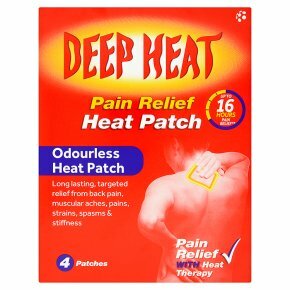 Odourless heat patch. Long lasting, targeted relief from back pain, muscular aches, pains, strains, spasms & stiffness. Pain relief with heat therapy. Odour free. Drug free. Apply directly to skin.Activate in 1 minute* *The patch activates within 1 minute and will heat up within 5 minutes providing penetrating warmth for up to 8 hours. Up to 16 hours pain relief** **Once removed it can continue to provide pain relief for a further 8 hours. Heat therapy is well recognised and recommended by health care professionals for muscular pain and stiffness Long lasting, odourless, drug-free, warming pain relief to help get you through the day Dual Action Pain Relief Therapeutic heat from the patch helps reduce pain giving a targeted analgesic effect right where you need it Heat Therapy Penetrating heat helps relax stiff, sore, aching muscles & joints helping to restore movement Heat increases blood flow to the affected area providing oxygen and nutrients to aid the healing process Recommended for muscular pain, strains and joint stiffness. Can be used for back, hip, thigh, calf, arm, neck and shoulder pain. Please read all instructions and warnings carefully before use. This product is air activated. Open only when ready to use. For Best Results Apply patch to affected area. Delicate or aging skin: apply adhesive side of patch to clothing. Instructions for use: Use on clean, dry skin Tear open the plastic packet, remove protective film from patch and apply patch to the affected area, adhesive side onto the skin or to clothing Do not bandage over the patch Do not cut, massage, fold or wet the patch To remove, slowly peel off the patch After use, dispose in normal household waste Single use only. Do Not attempt to reheat in oven or microwave Speak to your doctor or pharmacist if your symptoms do not improve. Do not use:<br>On the face or on broken skin, bruises or swellings<br>Whilst asleep or with prolonged pressure against patch<br>On infants, children or persons unable to remove the patch on their own<br>With other skin medications or other heat sources<br>If the patch is damaged or torn<br>On the same area for more than 8 hours in any 24 hour period.<br><br>Warnings:<br>All heat patches have the potential to cause skin irritation, burns or blisters<br>Discontinueuse if skin sensitivity occurs or the patch gets uncomfortably hot<br>If you are diabetic, pregnant, have poor circulation, nerve damage, a skin condition or an allergy to sticking plasters, consult your doctor before use<br>For external use only. Do not ingest as the ingredients can be harmful. If swallowed seek immediate medical help<br>If contents of the patch come into contact with the skin or eyes rinse immediately with water and seek immediate medical help.